Prior to founding Chicago Classic Coach LLC, President Richard L. Hausman resurrected another local company, making it a major market player. One evening, he went to dinner with another industry veteran to discuss possibly buying that company. Within an hour, his colleague’s wife told him that he should just start up his own company. That being a dream of his for the past ten years, he started Chicago Classic Coach. “It turned out to be a pretty good piece of advice,” recalls Hausman. The Mount Prospect, Ill.-based operation’s top management team collectively has approximately 100 years of experience in the motorcoach industry. The company began operating in February 2006 after taking delivery of its first two coaches. Starting with a five-year plan to acquire 25 coaches, they currently have a 22-coach fleet. The team, with its numerous years of industry experience, knew they had to foster relationships with customers by offering attentiveness, flexibility and reliability, as well as by developing agreements with other industry professionals in order to be successful. Providing service 24 hours a day, seven days a week, Chicago Classic strives to be available to customers through flexibility. In less than two years of being in business, Chicago Classic has hired more drivers and invested in four more buses that will run daily to accommodate an extended casino contract agreement. Another alliance the company has created enables them to easily handle jobs requiring many buses. “Sometimes if we get a job that requires more buses than we have, we partner with another company and use their buses. 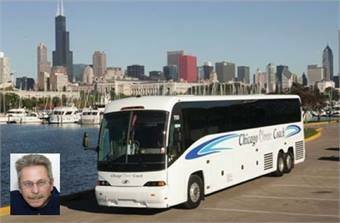 Some companies we partner with are Coach USA, Midwest Motorcoach and Mid America. Companies know that even if they have a 35-bus run, we can handle it,” Hausman says. The operation’s efforts to reach out to customers also include emphasis on green and safety issues. Recently Chicago Classic received four MCI J4500 coaches; making the operator the first in the area to add the clean-diesel, low-emission luxury coaches to their fleet. “Our corporate partners are very interested in offering green services to their customers. We are telling people about the advantages of motorcoaches, such as getting 56 people off the road.” The company is also ordering a new hybrid vehicle to use for safety and training courses, and will have a monitor out on the road to review driver performance.